Fudgesicles. Fudge Ice Pops. What ever you call them, call them delicious. 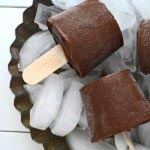 These are the ultimate summer treat…fudgy, creamy, and rich! Over medium heat, in a saucepan whisk together the milk and the tapioca flour, then whisk in the cocoa powder. Bring to a boil while whisking constantly, then reduce the heat and simmer, while stirring often, for about 5 minutes. Remove from the heat, then add the semisweet chocolate, and stir until the chocolate is completely melted and the mixture is smooth. Stir in the condensed milk and the vanilla. Option #1: You can use an ice pop mold kit. BUT I had a terrible time getting mine out of the molds, so I went with option #2. Option #2: You can pour the mixture into a mold (or small cup) of your choice, freeze until slushy, then insert sticks and freeze until solid.